Rochelle Clarkson retired from teaching dance—twice. She was ready to change course and enjoy sailing more with her husband. But a funny thing happened on their way to the ocean. While having coffee with a friend, who is a noted life coach, the discussion turned philosophical. He shared his belief that everyone is put on earth to do one thing. It hit home with them. Two years later, Alliance Dance Academy is not only going strong, it’s growing. Clarkson and her team recently moved into a 3,000-square-foot building at 39 Persimmon Street, where the burgeoning studio can stretch its legs, so to speak. 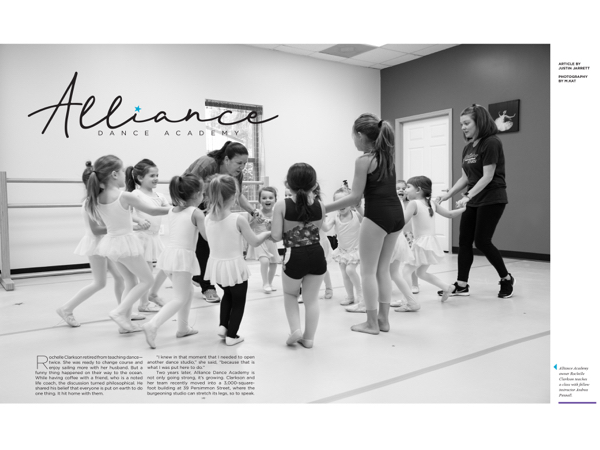 The new space has plenty of room for the family to grow, and that’s exactly what Clarkson considers Alliance Dance Academy to be: a family. The lobby is decked out with comfy couches and chairs where parents can sit and watch their children dance on closed-circuit TVs, and there’s a section where siblings can entertain themselves with puzzles and games. But although Clarkson wants the studio to feel like home, she knows it’s no substitute for the real thing. When starting her new studio, she wanted to offer a more laid-back approach, even with the competition squad, STARS, which dances two days a week for three and a half hours at a time. As long as the dancers’ technique is strong, the extra rehearsals are unnecessary, Clarkson said, and when it does come time to rehearse and compete, they are fresh and able to have more fun and perform better. They’re also able to have a life outside the studio, which is just as important. Luna, age 3, proudly tells us she’s headed to dance class. Besides, by the time dancers graduate to the STARS team, they have plenty of seasoning. That’s because Alliance takes pride in its preschool program that uses Clarkson’s time-tested method for teaching the tiniest dancers. One of the keys is finding the right teachers. Clarkson only hires teachers with a college degree who have been teaching more than four years, and she wants them to share her philosophy of helping each dancer learn not only great technique, but also life skills that will help them flourish outside the studio. Clarkson wants the staff to be just as close-knit as the dancers. She invites the teachers to her home to connect and get to know each other, takes the staff out to dinner, and does her best to make them part of the family. After retiring the first time when she moved to the Lowcountry from Florida, where she owned a studio for 10 years, Clarkson realized she wasn’t quite ready to give it up. She took a job teaching part-time at another local studio and eventually became the studio director—a role she held for six years. When she came out of retirement the second time, it was because she needed to share her passion with her new hometown of Bluffton and build a new dance family to fall in fall in love with. 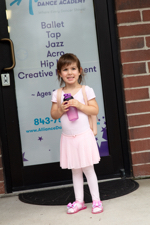 Alliance Dance Academy is located at 39 Persimmon St., Suite 404, Bluffton. 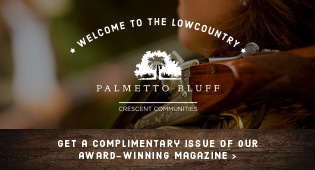 For more information, visit www.alliancedanceacademy.com or call (843) 757-8277.